Bradley’s students traveled down to Dallas, a city of 1.3 million people. 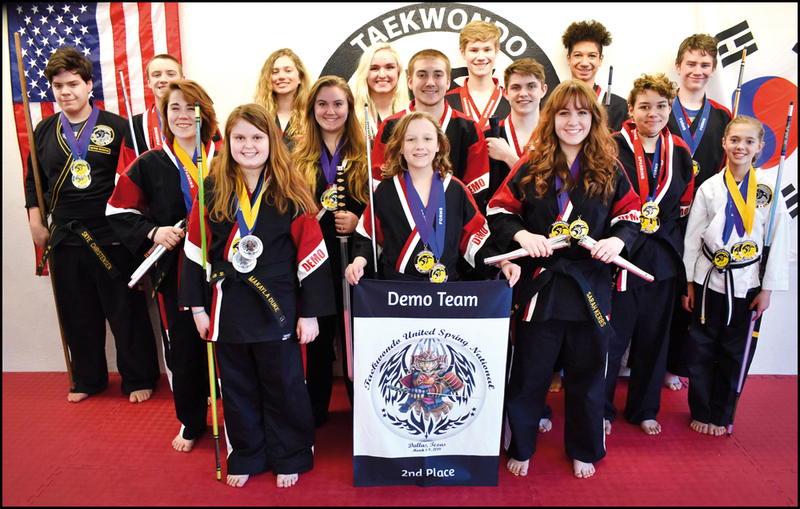 They weren’t intimidated by taking on 500-plus competitors at the event for Taekwondo United, the martial arts federation that Bradley’s is a part of. Bradley’s Demo Team, which won a national championship last year, finished with a second place finish this year, coming up as the cream of the judged demo team competition which can be a hair’s difference between first and second. Black Belt students and instructors had demanding promotions, ones that required skills years in the making. Bradley earned her Senior 4th Degree Black Belt, Connor Haines tested and earned his 3rd Degree Black Belt. Tasha Weant was promoted to 3rd Degree Black Belt and she won a gold medal in board breaking, while also getting second in traditional forms and third in sparring. Nate Larsen earned his 3rd Degree Black Belt, also placing fourth in traditional forms, fourth in sparring and a gold medal in board breaking. The national tournament held last month went two days over the weekend, covering traditional Taekwondo forms and sparring along with freestyle weapons, forms and demo teams. Skye Christensen tested for and earned his senior instructor certification while also placing first in beginner weapons and first in traditional forms. Hannah Kerbs was first in beginner weapons and earned a silver medal in board breaking. Amanda Potter won a gold medal in board breaking despite wearing a boot from a previous injury. Jimmy Kirry placed first in sparring, second in traditional forms and won a gold medal in board breaking. Makayla Duke won a gold medal in board breaking, while placing fourth in traditional forms and third in freestyle forms. Sarah Kerbs won a gold medal in board breaking along with third place in intermediate weapons. Bradley’s students went to the Dallas Zoo, where they got to pet and feed a giraffe and learn about mammals. They attended a show at Medieval Times for combat from a different era and continent, along with a trip to the Dallas World Aquarium. When they weren’t touring, they were competing and competing well. Alea Fazio placed second in sparring, third in Traditional Forms and third in Freestyle Forms. Dean Noe placed third in beginner weapons along with a silver medal in board breaking. Hans Bakken took fourth in sparring, Alexis Lee was second in beginner weapons, third in freestyle forms and second in traditional forms. Zack Larsen was third in both intermediate weapons and forms while Ursula Bakken won a silver medal in board breaking. The work isn’t over as now the school will be training for the September National Tournament. As more local students learn about nationals, more want to go. “What holds a lot of them back is funding,” Bradley said. But the school holds fundraisers to help offset costs, currently they do Break-a-thons and also have an in-studio fundraiser of chocolate bars and meat sticks. The school is also selling ad space on their t-shirts for their upcoming local Spring Tournament for any businesses interested to help students.